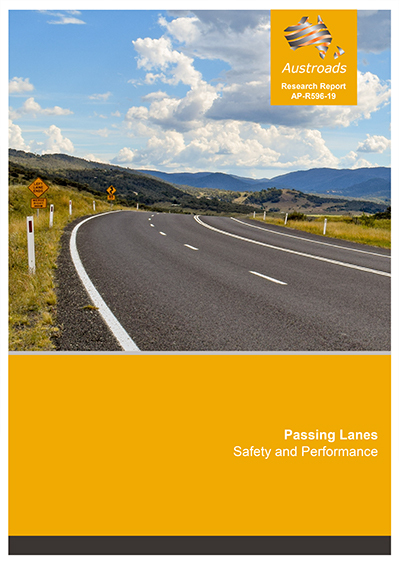 Austroads has published a report that provides guidance in the development of passing lane installation projects by examining their impacts on safety, journey time and user experience. This Austroads project was designed to establish the benefits associated with passing lanes to provide guidance to practitioners. road user experience survey, including an analysis of perceptions and valuation of level-of-service. Passing lanes result in safety benefits, including perceived safety by motorists, safer operational conditions, and crash reductions. Before-and-after crash analysis of routes where passing lanes were installed showed an average reduction of injury crashes by 16%. Literature on the safety impacts of passing indicates a degree of consensus that passing lanes contribute to the improvement of safety. Injury crash reduction as a result of passing lane installation ranged from 20% to 40% across the documents reviewed. Passing lanes improve journey times through a small increase in travel speed and a significant reduction in the proportion of time spent following a slower vehicle. Platooning behind a slow vehicle is a cause of frustration amongst motorists. Literature demonstrated that motorists consider passing lanes effective and beneficial. A survey of motorists indicated that for the journey experience to be generally acceptable, the per cent time spent following a slow vehicle should be limited to 30% to 40%. Motorists were also found to attach a value to per cent time spent following of approximately $4 per 100 vehicle-km travelled for every 10% improvement in time spent following. To assess journey time impacts of passing lanes, numerical experiments were conducted using the traffic simulation model TRARR (or TRAffic on Rural Roads). The TRARR model was reviewed and its parameters were re-calibrated to match current vehicle fleet and recent field data. Join us for a free webinar on Tuesday 5 March 2019, 1pm AEDT for an overview of this study by the report author Dr Ian Espada. No charge but registration essential. Can’t make the live session? Register and we’ll send you a link to the recording. Register now!